I always find myself feeling a tad nostalgic around this time of year. In the past, this month has always brought about some sort of marked change in my life. It never failed to bring adventure, launching me into motion and transition whether I was ready for it or not. May closed out school years, marked the beginnings of adventures abroad, welcomed me home to California, and gave way to new jobs and opportunities. May felt reliable, in an exhilarating and stomach churning sort of way. The months that would follow would sometimes be relaxing and at other times challenging. But, no matter where in the world my summer plans took me, I always found comfort in knowing I'd be going home in the fall to the start of a new school year, to family and friends. I took comfort in knowing I'd return to the familiar. Two years ago I was packing my bags for a summer in Copenhagen. One year ago I was graduating from the University of Vermont, saying sayonara to the home I'd made there, and heading for Maine to live and work on a farm by the sea. Though excited, I was equally anxious about this new phase, fully aware that I wouldn't necessarily be returning to old friends and family at the close of the experience. It was in Maine I met Lizzy, one of the most lovely, free-spirited and kind women I have ever known. She had just moved north from New York City, looking to disconnect and get her hands dirty. She and I became fast friends and spent our days weeding, chasing chickens, hiking in the hills, and harvesting the summer produce and fruits grown on the farm. It was both hard work and dream like, and sometimes it's hard to believe the experience has already come and gone. Time flies. It didn't take long for me to notice that Lizzy took whole cooking and eating to another level. She'd walk barefoot through the soil and crunch on kohlrabi leaves and raw rhubarb, sometimes popping a strawberry or two into her mouth, leaves n' all. She taught me to appreciate food in it's natural state, and that more often than not it tastes best that way. 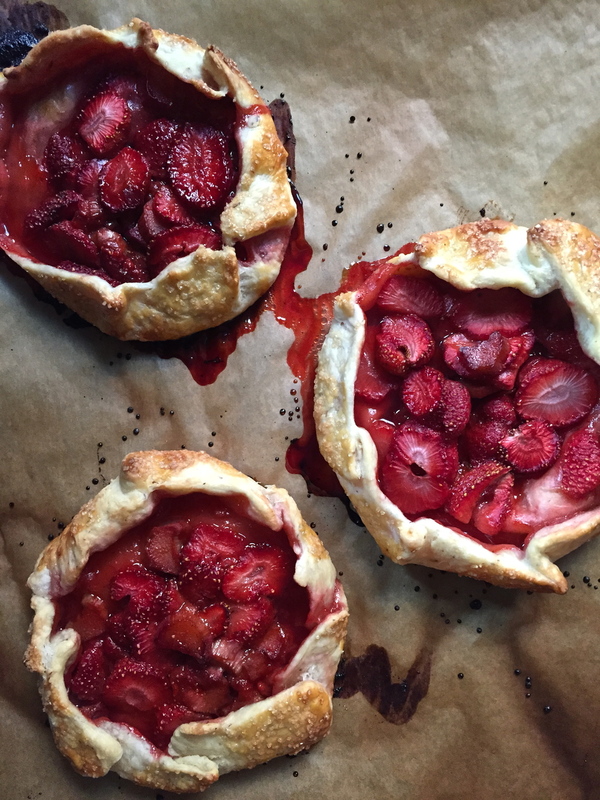 This strawberry rhubarb galette is both tart and sweet, just as strawberries taste early in the season. They're perfect for a picnic with friends, a breezy birthday celebration, or simply for a "just because" treat. Whip these up and let me know how you enjoy them. Happy baking! For the dough - mix the flour, flaxmeal and salt together in a large bowl. Add the cubed butter and work into the flour mixture with your hands until it looks like coarse meal. Slowly drip in the ice water, working the dough into an imperfect ball. It should be flakey and just barely holding it's shape. You may not need a full cup on ice water, so simply add as needed. Once the dough comes together, wrap in plastic wrap and refrigerate for at least 20 minutes. For the filling - Place coconut oil in a heated pan. Once melted, add the rhubarb and cook until softened, roughly 5 minutes. Combine the sliced strawberries and rhubarb in a medium bowl. Toss evenly with sugar and set aside. Roll out chilled dough between two pieces of parchment paper. It prevents sticking! Place the dough on a cookie sheet and cut into circles roughly 6 inches in diameter. This should yield somewhere between 8-10 galettes. You can get creative with this step, making one big galette if you prefer, etc. Spoon the strawberry mixture in the middle of each circle, leaving about an inch wide border all around. Fold and pinch the crust over the strawberry rhubarb filling. Beat one egg with a fork, brush the crusts with it, and then sprinkle the galettes with raw sugar. Bake for 35 - 45 minutes, or until the crusts are golden brown and flakey. Enjoy as is, with a dollop of fresh whipped cream, or with a scoop of vanilla bean ice cream!